The plans are finally complete, he said, and they have raised enough money to get started with construction. There will be a groundbreaking at the end of November, and he hopes it will be complete a year from now. 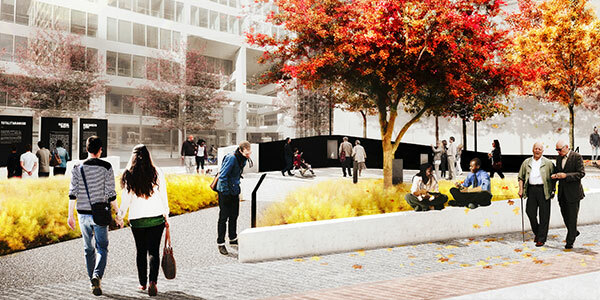 The plaza will share the space with Polish sculptor Nathan Rapoport’s Monument to the Six Million Martyrs. In 1964, Philadelphia made national history with the installation of the statue, becoming the first city to construct a monument to the Holocaust. 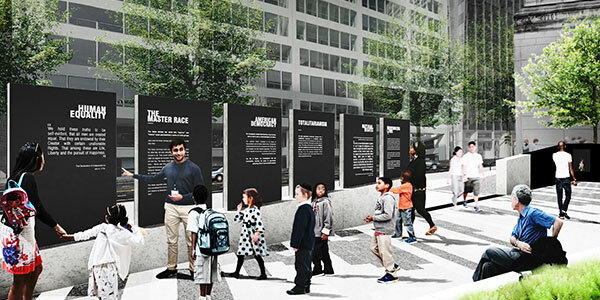 Initial plans for the plaza include an eternal flame, six pillars representing the 6 million Jews who perished under the Nazi regime, railroad tracks used to transport individuals by train to concentration camps, a remembrance wall, and a small “forest” of trees, one whose saplings dates back to the Theresienstadt concentration camp in Czechoslovakia. Adelman, who acknowledged there have been some false starts with the project, hopes the community will see it as something they can — and should — get involved with. “My hope is that this really starts the story of getting people in our community to participate and contribute to a really worthwhile project,” he said. For him, the importance of the project transcends generations. “It’s to honor the victims of the Holocaust,” he said, “as well as remind our children and grandchildren and future generations who might not have the experience of being able to talk to a survivor [of] what happened, that this was real, and how to prevent something like that from happening again in the future. They are still fundraising for the project, for which they have raised $4.2 million of their $7.5 million goal, he said. They’re also still looking for main name sponsors. “I’m hoping that those who would consider giving who were unsure about the viability of the project see that we now have a viable project that’s starting and they’ll jump on board and contribute,” he said. 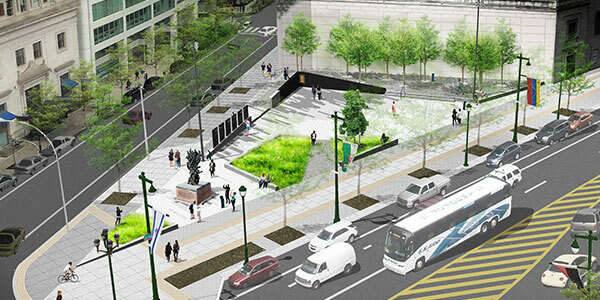 If the project is completed on time next year, it will also be done in time for the 100th celebration of the adjacent Benjamin Franklin Parkway. “It’s just a great time,” Adelman said. “We finally have a great plan, we’ve got enough money to get going, and we think we need to now put the marketing push behind it so this community can support what a terrific board has come together and done.